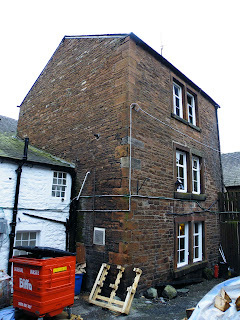 A recent visit to Penrith prompted me to investigate the Duke of Gloucester a little closer, especially regarding the claims that the building contains the remains of a pele tower. Above. The rear of the Duke of Gloucester. Well, it appears that the remains of the tower are actually hidden at the rear of the inn, almost invisible from the road at the front of the inn. The tower has been heavily modified and incorporated into the later 16th and 17th century building at the front. It is of three storeys, and measures roughly ten feet by ten feet. As with other towers in Cumbria, all 'tower' characteristics have been removed. 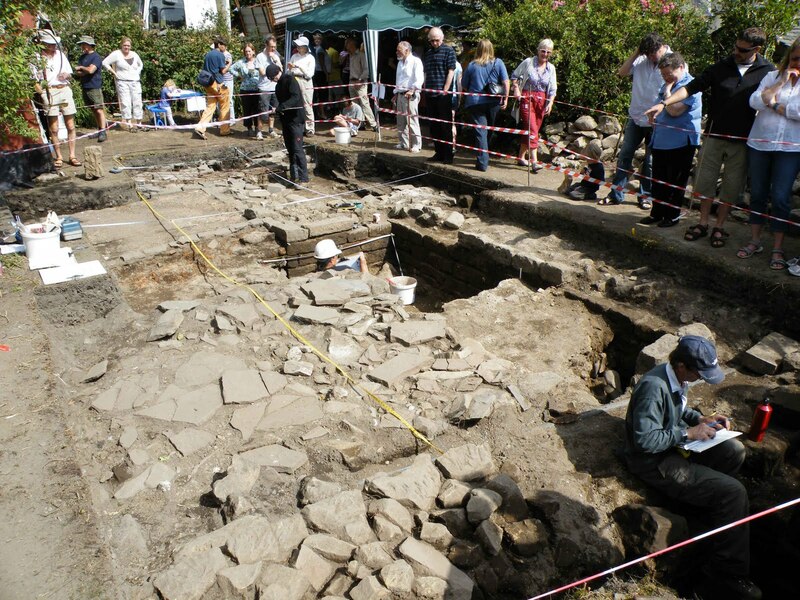 The scant remains of the Roman bath house and the rubble remains of the wall can be found less than a quarter of a mile to the North of Lancaster Castle and the Priory. 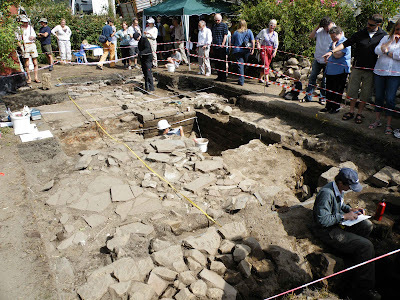 The main point of interest for this blog however, are the remains of the wall. Above. 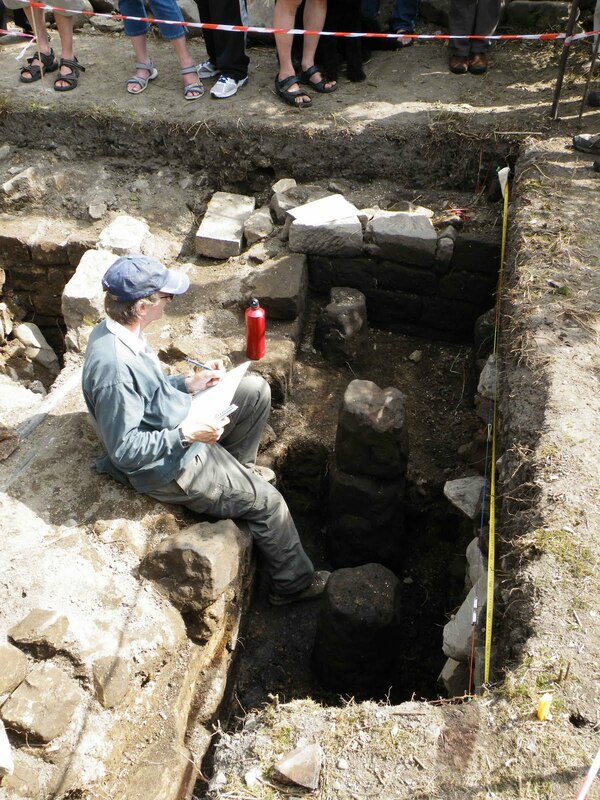 Good view of the bath house remains, and the wall beyond. 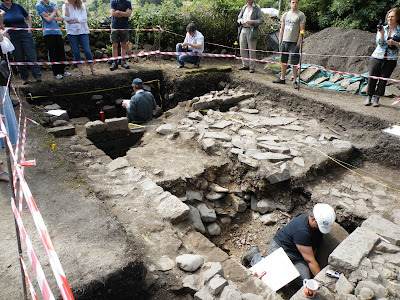 The photo above, shows the excavated remains of a bath house, possibly dating from around 367AD, with a fragment of walling visible just beneath the branches of the tree next to the modern building. Above. Close up of the remains of the wall. 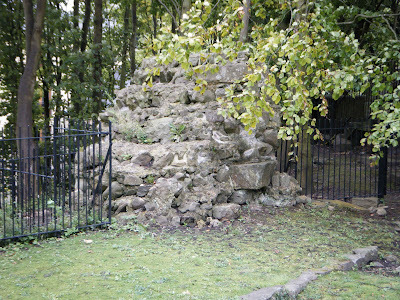 The fragment of wall is now merely a pile of consolidated rubble....all the facing stones that would once have finished the wall have long since been robbed out, leaving behind a stump of wall, representing the last vestiges of a fortification that would have once surrounded the Roman fort here in Lancaster. 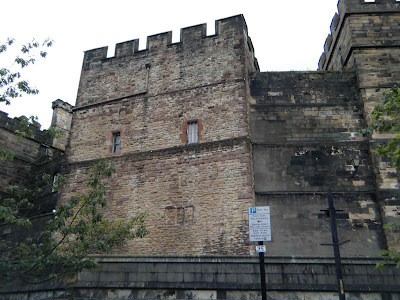 I can't find any reasoning behind the name 'Wery' wall, but it is evident that it started life as part of the Roman fort, and then subsequently may have been incorporated into the Norman fortifications here in Lancaster, and then later still, became part of the early medieval attempt to surround the town of Lancaster with a defensive wall. 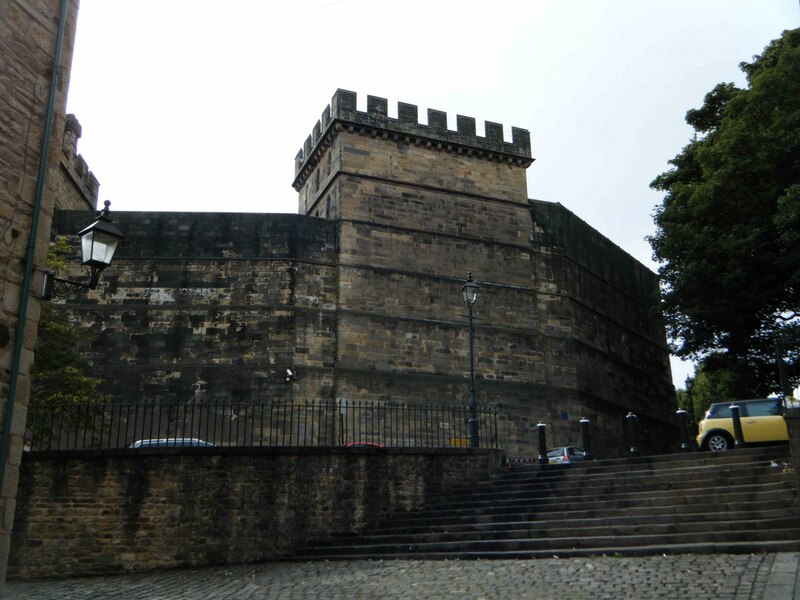 Historical documents dating from the 11th to the 18th century all mention the Wery wall, indicating its original importance as part of the defences of the regionally important town of Lancaster. 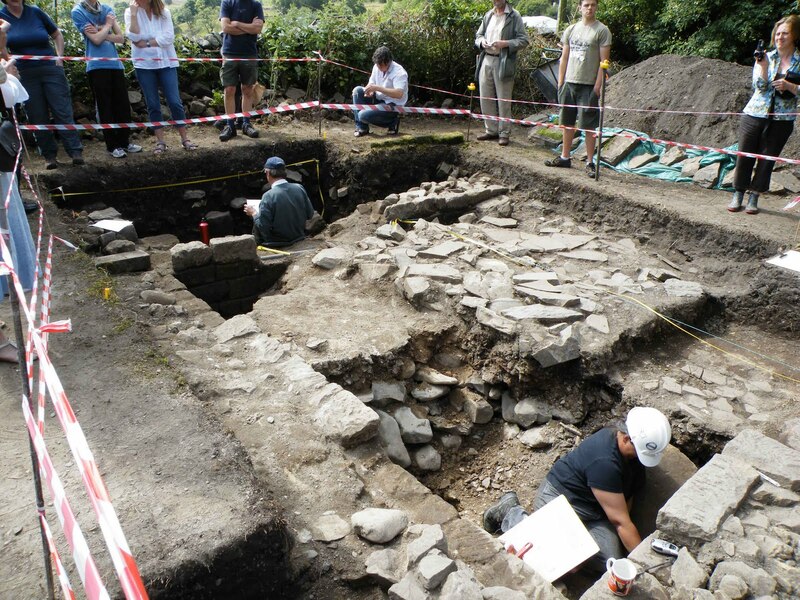 Access to the bath house and the remains of the wall is free, and the site is open all day long. 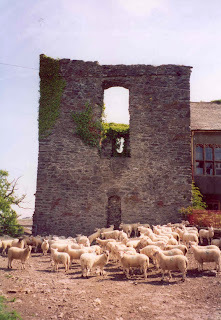 I first visited Burneside Hall in April of 2005...in fact, it was the first pele tower I'd ever seen and it was probably the building that set me off on this quest to photograph all of Cumbria's towers and castles. So it came as a great surprise when I realised that I had no photos on the blog, and no information about this wonderful old tower. 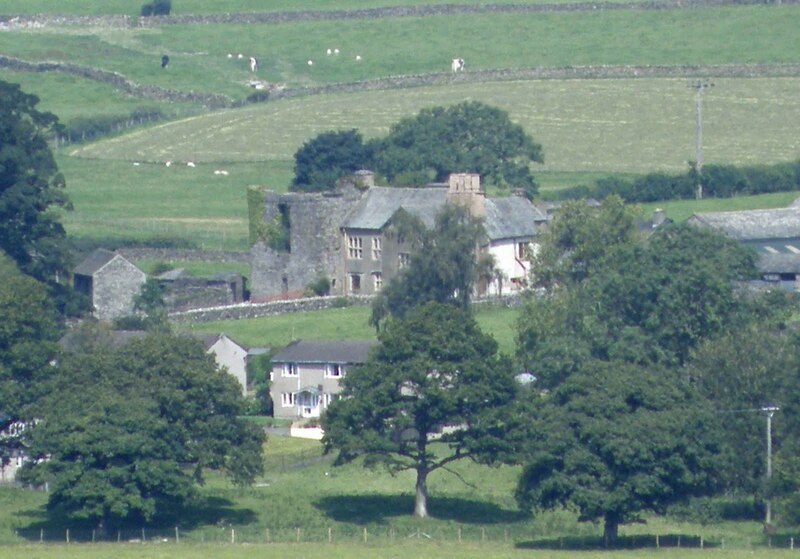 Burneside lies around two and a half miles North of Kendal. 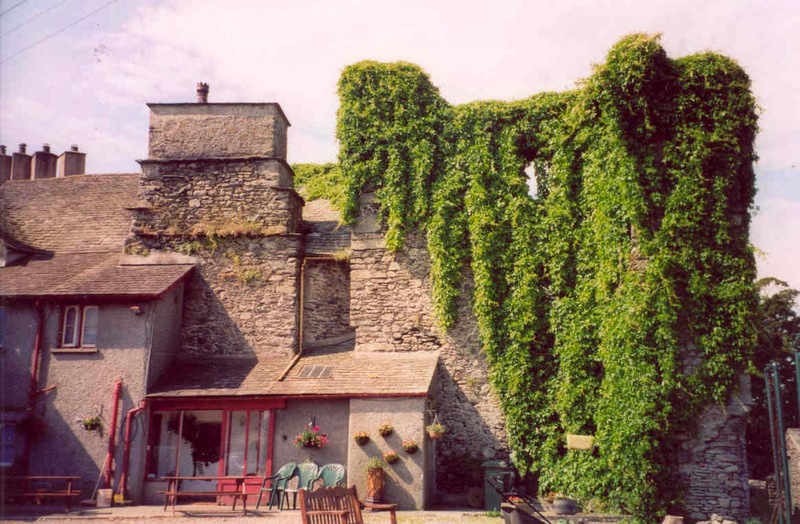 The hall and tower of Burneside sit to the North West of the village, and consist of the 14th century ruins of a large pele tower and hall attached to the East of the tower. 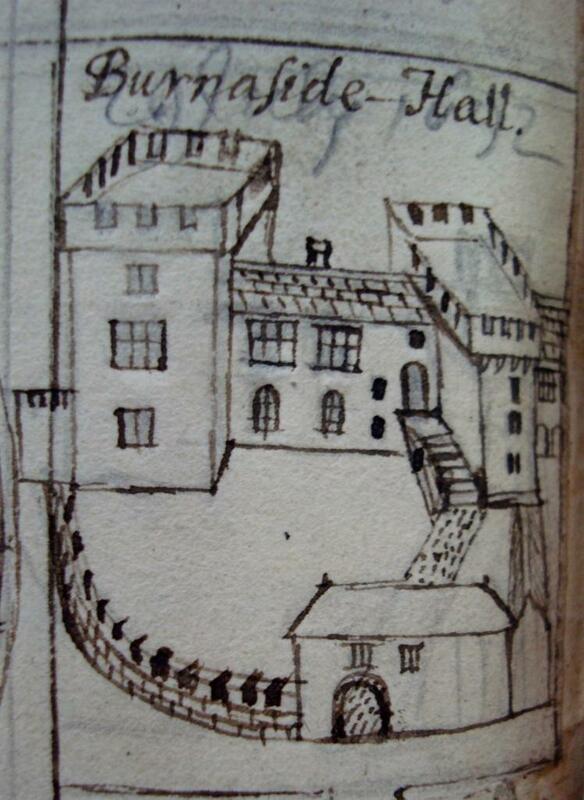 Machell's antiquary sketches of Burneside Hall show a three storeyed tower with an embattled roof line. 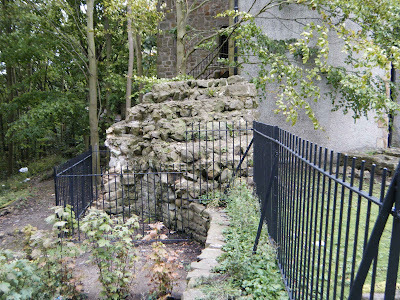 These days it is in ruins, to such an extent that in 2011 it made English Heritage's 'At Risk' register. The tower measures around 13 by 9 metres. 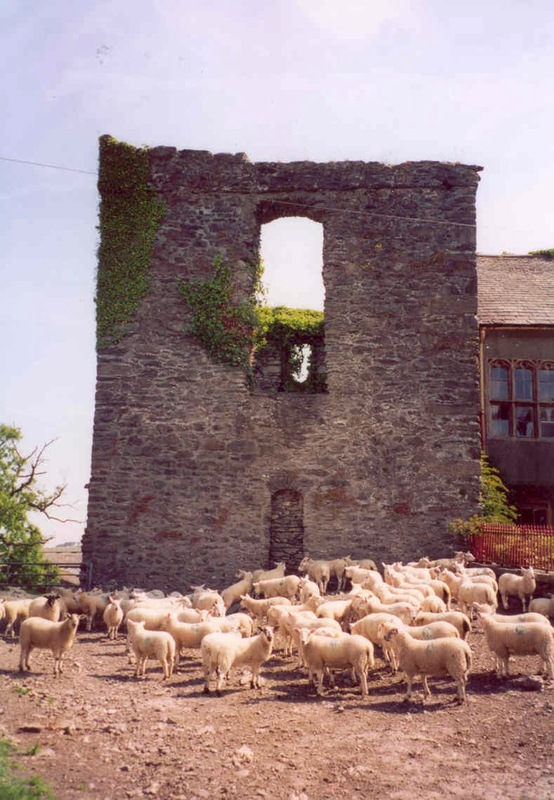 The gable walls probably stand to their original height, as does the South wall which borders the hall, whilst the front, or North wall, has largely collapsed down to first floor level. Above. 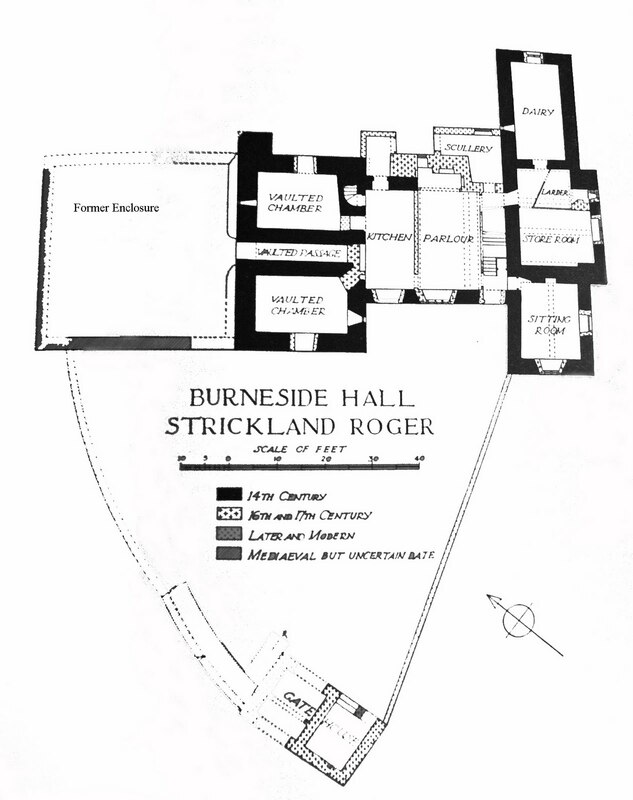 Plan of the tower and surrounding enclosures, walls and gatehouse. Above. View of the hall showing the ornamental pond and mound on which the tower stands. Above. Close up of the tower. 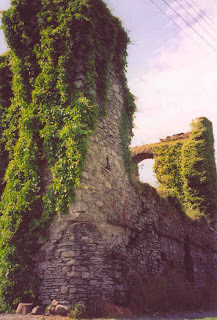 The lower parts of the North wall are formed out of the walls of a former enclosure that is thought to pre-date the tower. Several reports produced regarding the tower here at Burneside make mention of this much older feature, suggesting that the site is much older than the 14th century tower. The difference in building materials can clearly be seen in the photo above. Above. 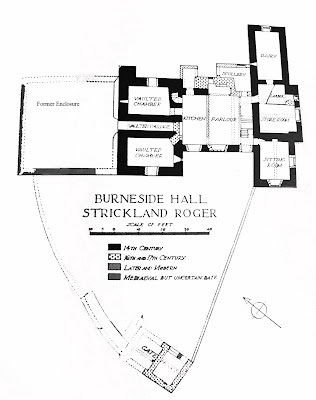 Early sketch of Burneside hall and its attendant buildings. 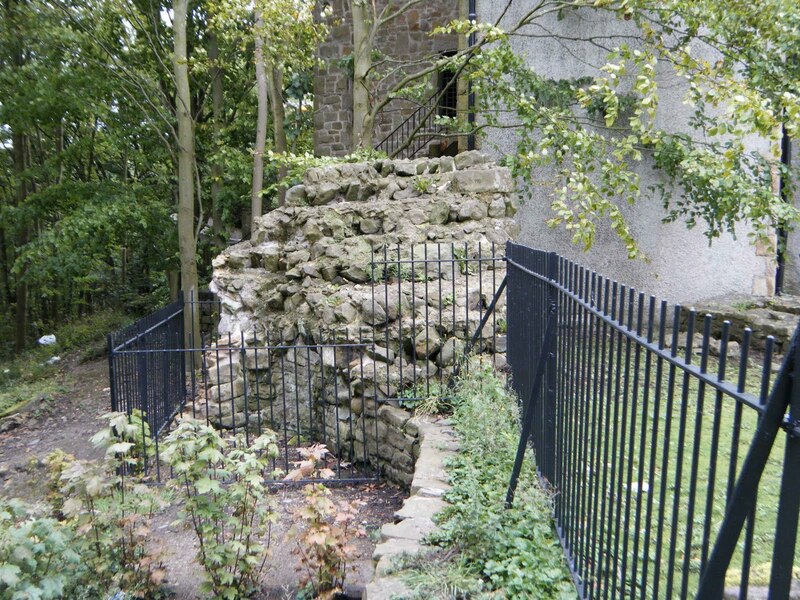 The enclose, which lies to the North of the tower, was first recognised in the 1936 RCHM survey. 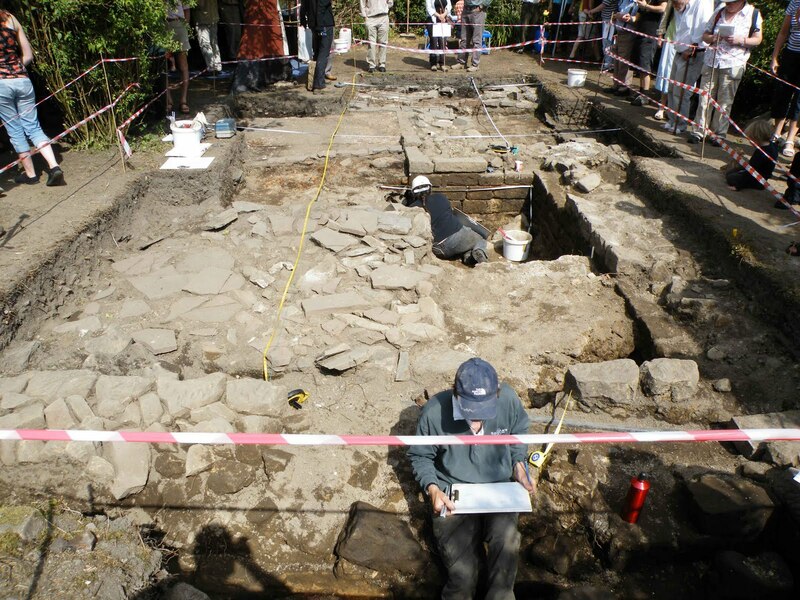 It measured some 11 metres square with walls around a metre thick. It stands in places, to around one and a half metres high, and is pretty much complete. Above. The well preserved gatehouse. The gatehouse lies to the West of the tower, and was most likely built in the 16th century, and possibly is contemporary with the remodelling of the hall. The original doors, made of oak, appear to still be in situ, although now not mounted on their hinges. It is thought that the gatehouse has, at some point, been reduced in size, as foundations are visible in the grass to the South of its walls. Whether this was due to collapse or deliberate rebuilding is not known. Above. 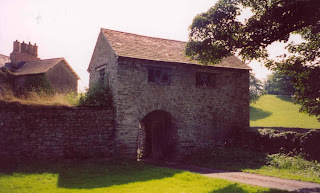 The gatehouse from outside the barmkyn wall. 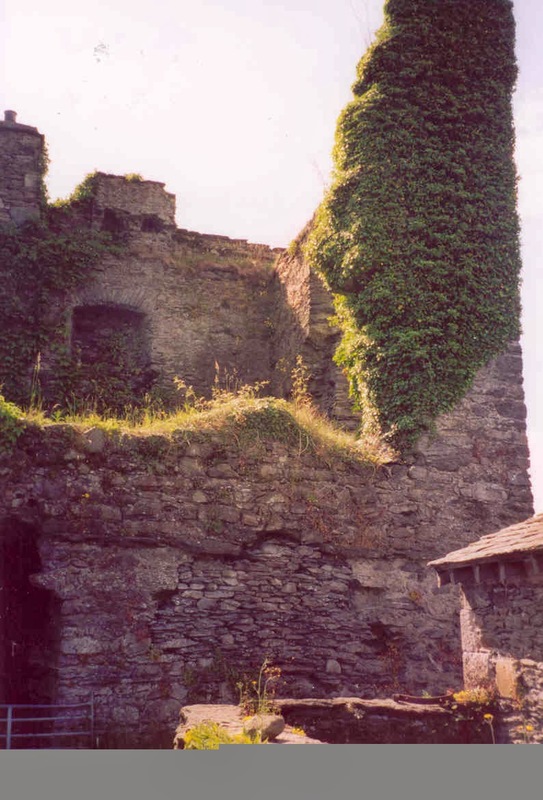 To the North of the gatehouse, an 8 metre stretch of barmkyn or curtain wall can still be seen. This apparently still retains a rough parapet walk. 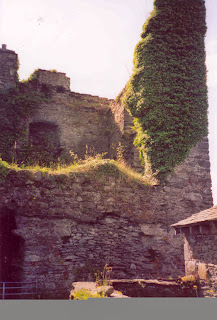 This tiny stretch of wall can be seen to the left of the gatehouse in the photo above. Above. The tower with the hall to the rear. 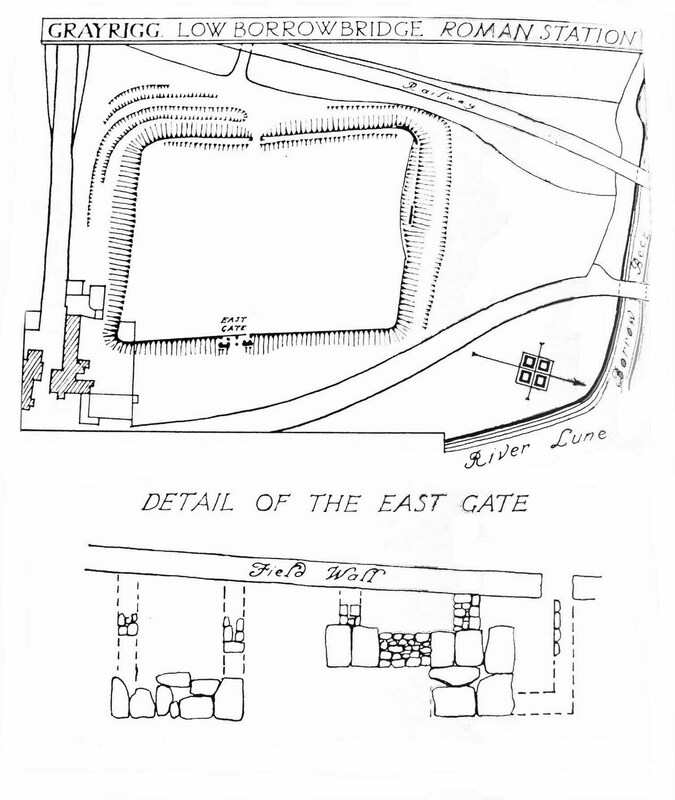 There are numerous foundation marks running along the length of the wall near to the gatehouse, and Machell's sketches show a number of buildings built against the inside of the wall. 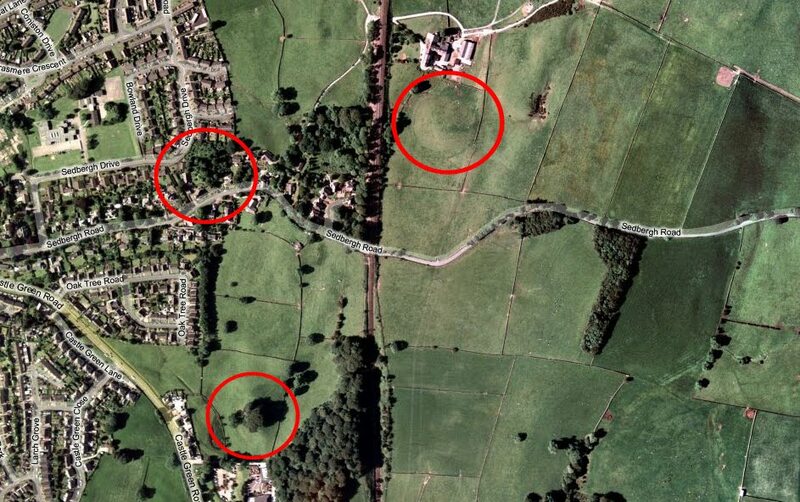 There is also evidence of fishponds and other unidentified earthworks to the West and South of the tower. Great views of the tower can be had from Hall road, though parking is very tricky owing to the narrow roads. Below. A small selection of old postcards and prints of Burneside Hall. 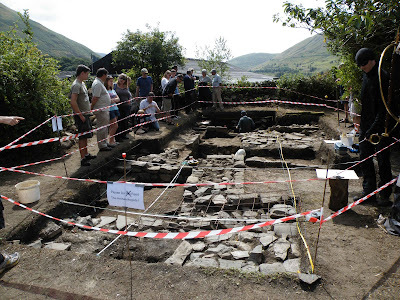 In July of 2011, the Lunesdale Archaeological Society managed to get permission to commence a dig at the Low Borrowbridge Roman Fort just outside Tebay. I visited on the open day, and managed to get some photos of the site that was excavated just to the South of the fort, and also managed to get some much better photos of the fort without having to furtively sneak around. Check out the older photos and write up of the fort here. Above. 'Digger' up to her neck in it! Above. 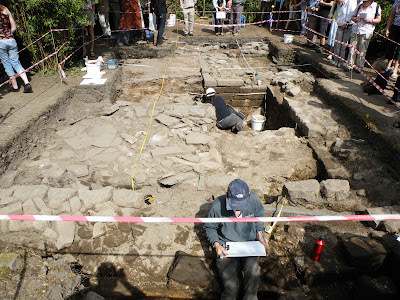 The long slow laborious process of documenting the finds. Above. And here he is again. Above. 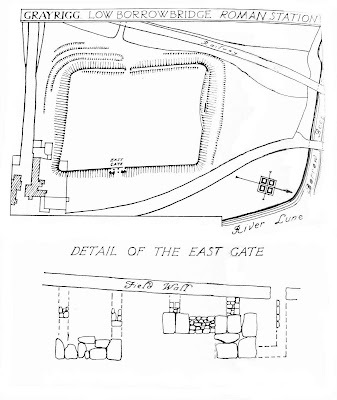 Plan of the fort. Above. The West gateway from inside the fort. Above. An inside\outside view of the fort from the top of the earthen bank. This photo shows the inside of the fort to the left of the bank, and the defensive ditches to the right. 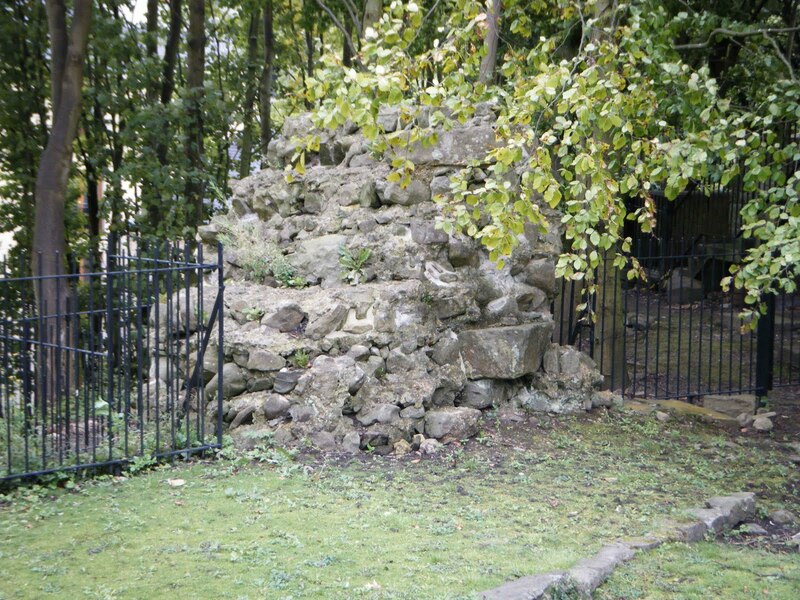 I think the stone walling on top of the original Roman defensive bank was probably robbed from any standing walls that were, apparently, still visible prior to the outbreak of World War I. They will probably have been cleared to allow the field to be ploughed and planted for the war effort. I think we can probably forgive the farmer for this!! Above. A view of the interior of the fort from the North West corner looking South towards Blease Fell. Above. The gateway in the Western side of the fort. Here there are still faint earthworks, possibly suggesting the site of two small buildings just either side of the modern gate. The gateposts are standing on top of two huge slabs of stone, possibly contemporary with the fort. Above. Looking North towards Jeffrey's Mount. Above. The South West corner of the fort, looking North East with Powson Knott in the background. 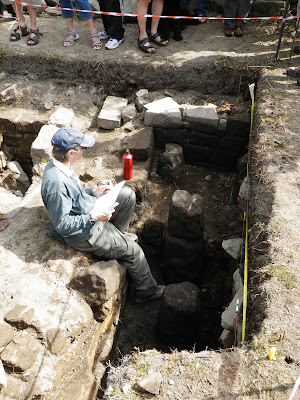 The man in the foreground gives a good idea of the height of the surviving external bank upon which the modern field wall is now built. It must be in the region of thirteen feet high. 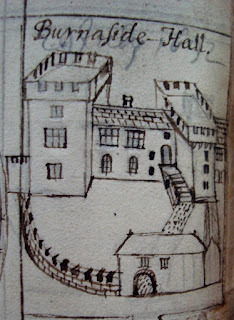 It must therefore have been much higher when it was originally completed, possibly with a wooden palisade on top adding further height and safety. Above. Looking North whilst standing in the foot of the ditch. The ditches to the West of the fort, although damaged by the building of the railway, are still around four feet deep. They would have been much deeper originally, and there would most likely have been much deeper when originally dug. 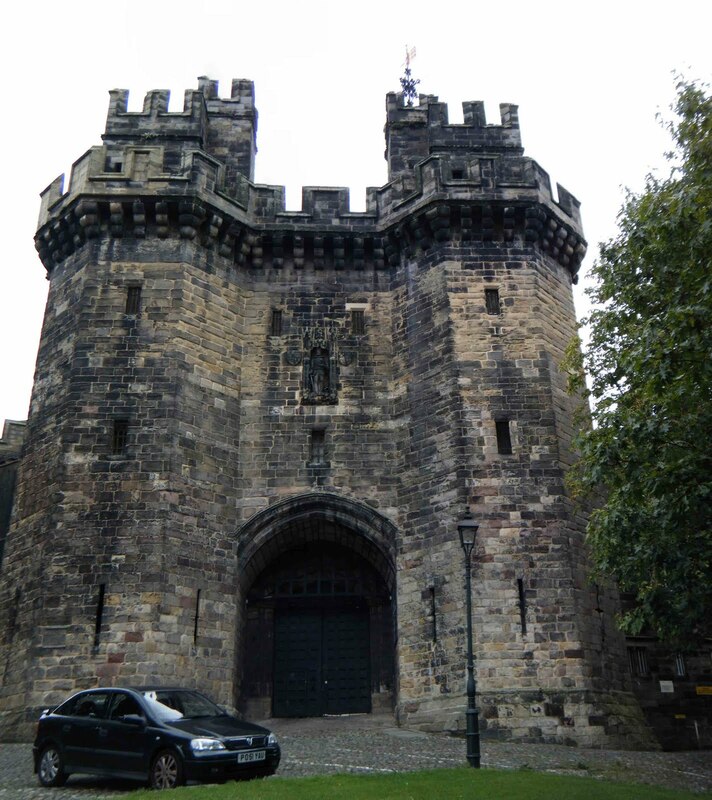 Described as a 'fortified ecclesiastical' site by the Gatehouse website, the Grade I listed structure consists of a collection of 11th to 14th century buildings. Above. 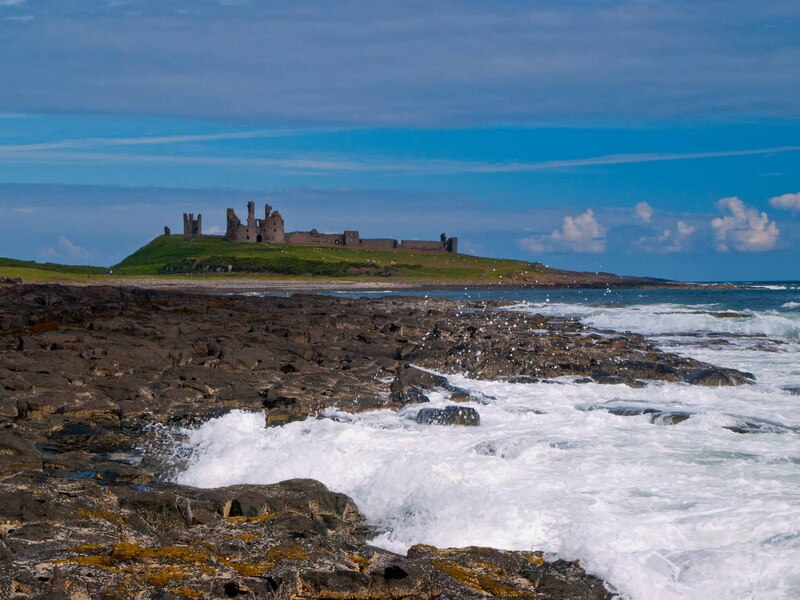 Looking East across the Ouse towards Lindisfarne Castle. 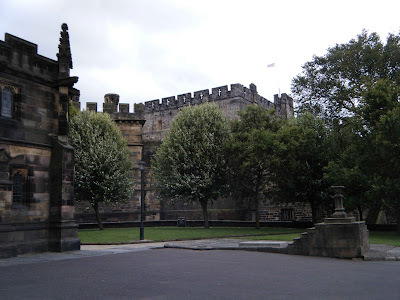 It's likely that the cloisters were transformed into a fortified courtyard sometime in the 13th century, possibly due to the closeness of the castle to the East. During the 14th century, towers were added and an outer ward built. Also in the 14th century, the Priory church was lightly fortified with the insertion of arrow loops in the West wall, and the inclusion of crenelations. 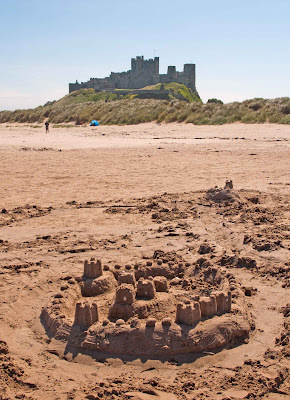 The priory started out as a Benedictine cell from as early as 634AD, suitably removed from the mainland and accessible only via a causeway at low tide. The Priory was suppressed in 1547 during the English Reformation. 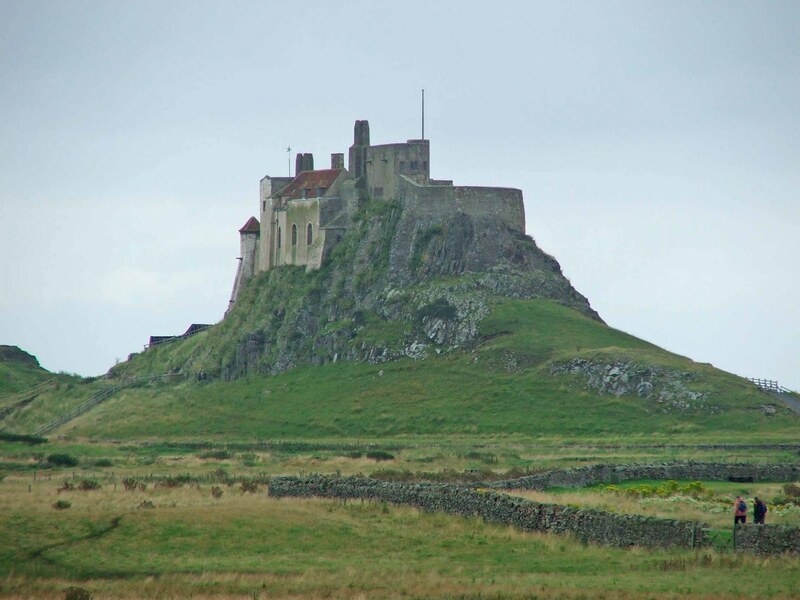 The Holy Island of Lindisfarne. Information at England's North East web site. Above. Bamburgh castle from the beach to the East. Above. 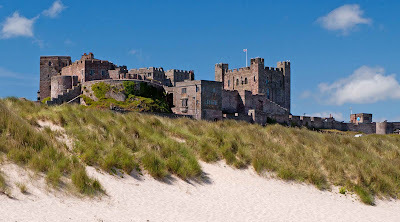 Bamburgh Castle from the East. Above. 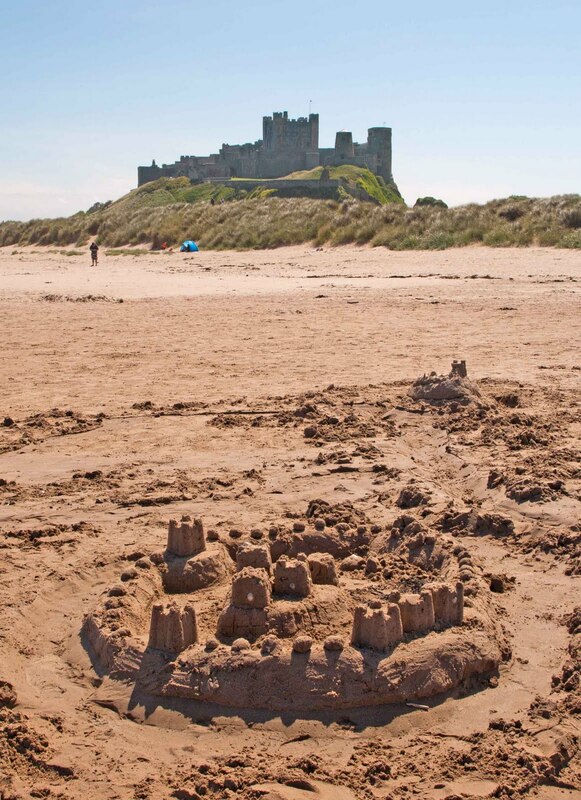 Modern and older castles together on the beach. Above. 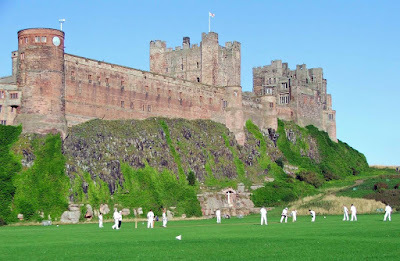 Cricket beneath the West walls. Photos courtesy of Malcolm Booker. 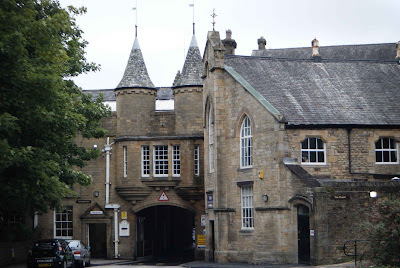 Situated on South Road in Lancaster, this building has a look of Scottish baronial architecture about it. 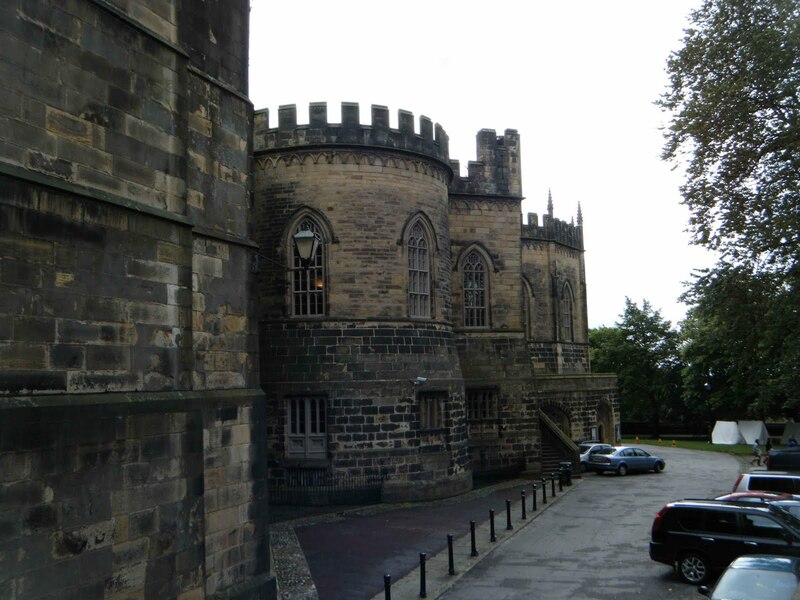 It is in fact the ex-barracks of the First Royal Lancashire Militia, alternatively used as the armoury and general stores until it was abandoned. Above. The barracks as seen from South Road. 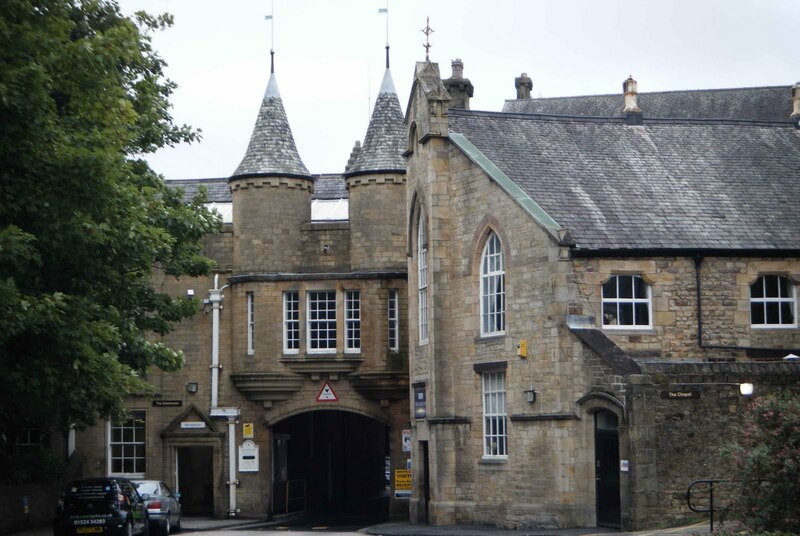 The barracks were built in 1854 possibly by Edmund Sharpe, and were converted around 1983 into offices. The barracks were built after the Militia Reform Act of 1852 was passed, requiring each county to build and maintain secure quarters from which new militia units could be mustered and trained. The First Royal Lancashire Militia eventually moved to Bowerham barracks in 1881, and the building was sold to Storey Brothers who used it as storage for their business. It was later purchased by Lancashire Enterprises in 1983, who converted it to offices. Web site for the Lancashire Militia. Now this site has been causing some confusion for a number of years now. The Pastscape website sites the 'motte' somewhere between the huge round hill at Birds Park Farm, and the small Woodland Trust managed 'motte' a few hundred yards to the West. Their map is confusing to say the least....check their entry for this site. I've always gone for the more visible of the three options for this alleged motte....and that was originally the huge round hill just to the South of Birds Park Farm on the North Eastern edges of Kendal. However....about a year ago, I found the feature in the field to the North of the Castle Green Hotel.....and was surprised to find so much masonry buried beneath the trees at the summit of the 'motte'. I've come to the conclusion however, that the 'motte' at the Castle Green is nothing more than a Victorian garden feature, most likely built by the Bindloss family when they lived at the Castle Green. The 'motte' at Birds Park Farm is harder to explain...perhaps it is nothing more than a drumlin...though it is very pronounced and doesn't have the normal tear drop shape that a drumlin has. Above. Aerial view showing the close proximity of the three sites that could represent Round Hill. The map, above, shows how close these three sites are, and how badly described the site is by both Pastscape and the Archaeology Data Service website. This is the text of the Pastscape website, describing the site "SD 532929 Motte shown on OS 1:25000 First Series as a circular feature with trees on top, now on the perimeter of Castle Park. The area is now administered by the Woodland Trust. (1) Probably a drumlin or a leftover from the railway which is adjacent to it. (2)"
On the map - Top right - Birds Park Farm 'motte'. Top left - Round Hill Wood 'motte'. Bottom - Castle Green 'motte'. The fact that the area is administered by the Woodland Trust (which was added recently) now points to a new site that I didn't know existed. 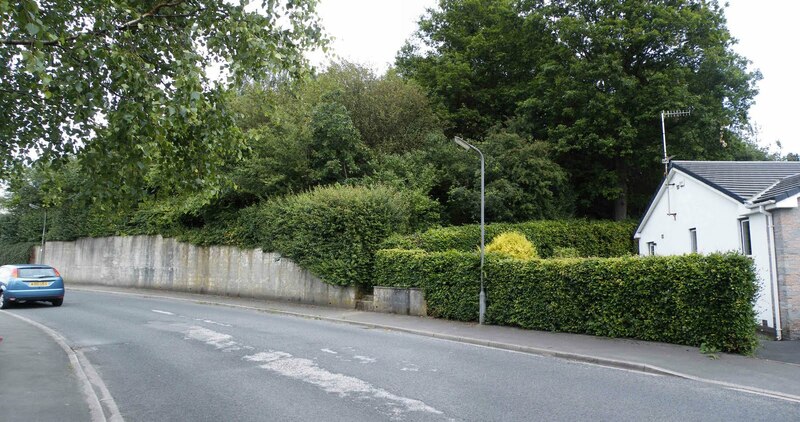 Just off Sedbergh Drive, at the Northern extremity of Kendal, there is a tiny wooded area, bounded on all sides by housing developments. Above. The entrance to the wood is through the small gap in the concrete wall to the left of the lamp post. Above. The Round Hill of Birds Park Farm. Drumlin or spoil heap? Above. The Round Hill of Castle Green Hotel. Most likely a Victorian garden feature. 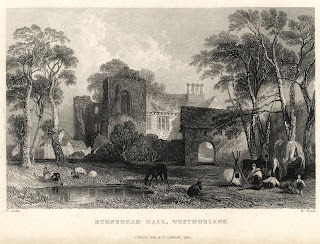 The Woodland Trust's website and details on Round Hill Wood.